After a long time, i baked a beautiful cake yesterday. I can say this eggless carrot cake is one of the best cake i have baked. The hot toffee sauce makes the cake more tasty. I wanted to make an carrot cake for a long time and this recipe i adapted from here and the yummy hot toffee sauce i adapted from Nags space. So go ahead and try out this easy eggless carrot cake with hot toffee sauce. Sift the all purpose flour, baking soda and baking powder for even mixing. Grate the carrots and add the condensed milk, melted butter and carrots in a bowl. Mix it gently and evenly. Add vanilla essence to this. Now mix this wet ingredients to the flour mix and gently mix it. Grease a pan and pour the cake mixture to this. I used a bundt pan to bake this carrot cake. Bake this in a preheated oven at 180 degrees. Mine took 40 minutes to bake this beautiful cake. Allow this to cool in a wire rack. To make the Toffee sauce,combine all the ingredients under the table “Toffee sauce” in a sauce pan. Gently mix this let it simmer for 5-7 mins until the mixture thickens. Switch off the flame and keep it aside. 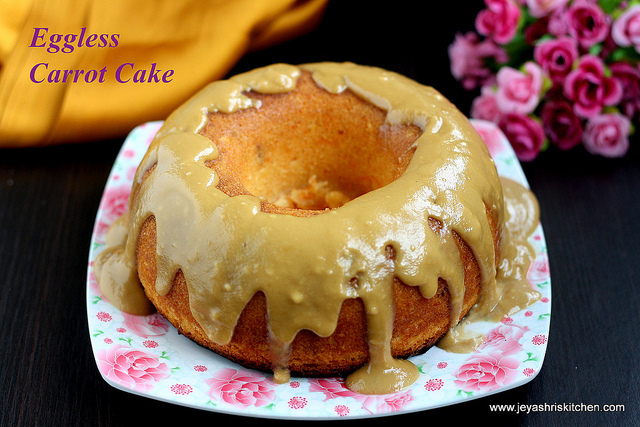 Just make holes in the cake with toothpicks and pour the toffee sauce over the cake. Cake is ready to serve. Do not skip the toffee sauce as it enhanced the taste of the cake very much. This beautiful cake i baked for a special occasion today as we are celebrating our 13 years of togetherness today. Do not skip the toffee sauce as it enhanced the taste of the cake very much. Will try it sometime soon. Happy anniversary!! happy anniversary and wish for long journey :) look beautiful ! Cake looks gorgeous... Happy anniversary dear!!! Oh my god they look so divine and yum.Lovely click jeyashri. wow..cake looks so fabulous...happy anniversary Jeyashri..tempting clicks.. Happy anniversary Jeyashri. Cake looks very tempting! Seriously i want a huge slice of this droolworthy cake..Looks absolutely incredible. Very easy to make . Its a definite crowd-pleaser . Cant go wrong with party's or kids events. Looks so so tempting, love that topping, makes the cake even more delicious.. Thank you vidya :) tat was an useful tip..
Dear jeyasri, what can i use instead of condensed milk?. I do not get it in my place. Oh Unfortunately i don't know replacements for condensed milk. Sweetened condensed milk substitute. Google search gave me this answer. I havent tried but. Hi...This will yield a 6inch or 8inch cake? Wow! What a splendid post. The cake looks so tempting and delicious. Absolutely drool worthy. Can I make the sauce in advance as well & pour it at the time of serving for guests? Or, would it be good to prepare it fresh? Hi Jeyashri, I tried this and it came out tasty, but with a couple of things not so good: one being the cake color was on the dark brown side & second was that it was hard around the edges. Any suggestions on what I could be doing wrongly? You must have over baked the cake, the temperature and cooking time varies from oven to oven. So according to your oven you keep control over the temperature and time. Try to keep the temp slightly low and cook for few more mins. Thanks, did that & it came out very well. Very simple & inviting recipe, thank you ! How to bake in a pressure cooker and how will I know that cake s baked well. What should I use to grease... I am a beginner. I haven't tried in pressure cooker subha. Can i use nestle cream for making toffee sauce?